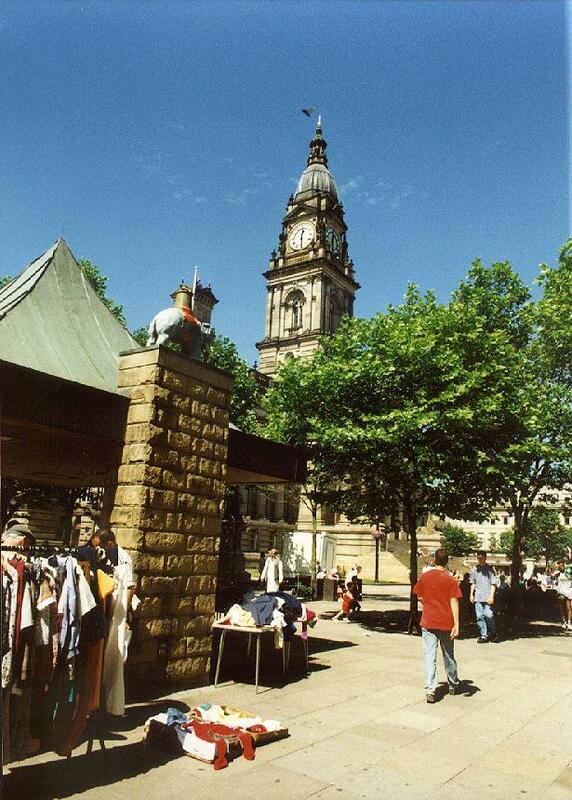 Victoria Square is a pedestrianised part of Newport Street in front of the town hall. Formerly this was the Market Square, when the market moved here from Churchgate in 1824. 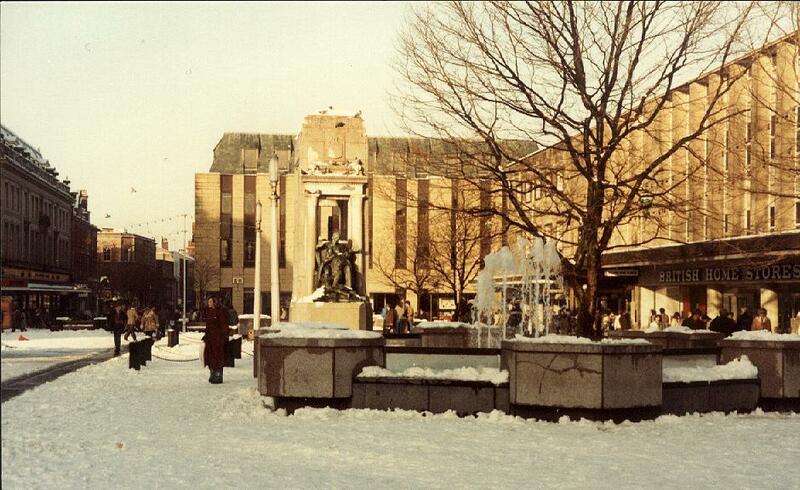 The area was one of the first, if not the first, to be pedestrianised in 1971. This central part of Bolton is very pleasant, and the pedestrianised area is an ideal venue for buskers and artists to perform (See a few pictures in the gallery). Each year there is a Buskers Ball where the talent is showcased. The fountains have been demolished now, the square has been refurbished, but here are a few pictures of the fountains. Also in Victorian Square used to be the Commercial Hotel. You are standing on the town hall steps Above your head is the clock tower, and a carved canopy. The seven carvings from left to right represent: Earth, with her horn of plenty; A young African carrying a basket of cotton; Manufacture with a stick for spinning flax; Bolton; Commerce with a heralds wand; A boy holding a boat; and Ocean watching a dolphin. 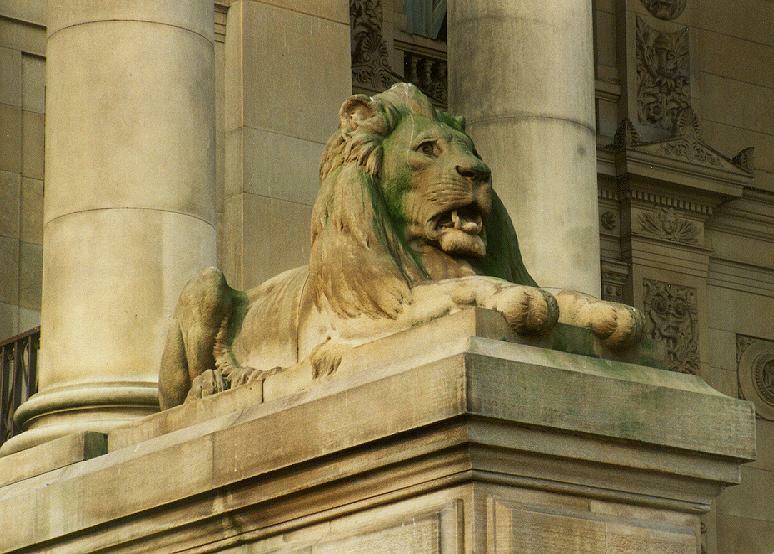 To the left and right of the steps are two ornamental lions. 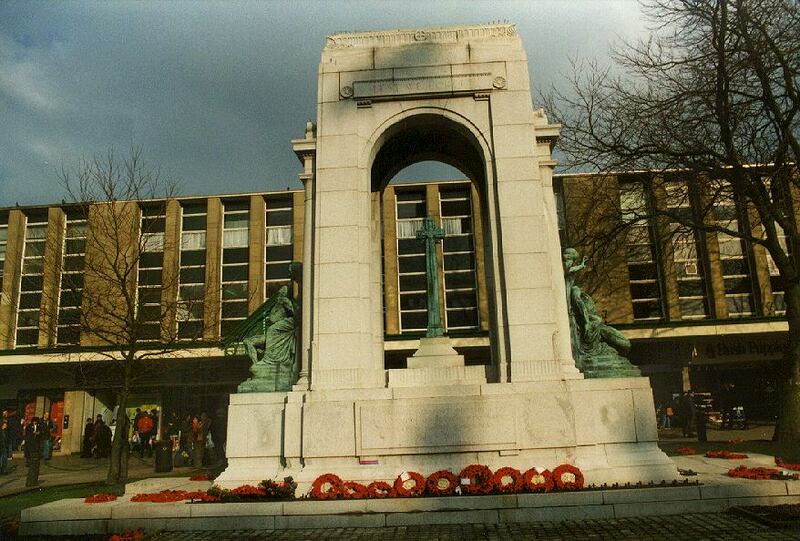 In front of you is a war memorial, to the left and right of this are two fountains, and behind all those is Crompton Place shopping centre. This pedestrianised area used to be Newport Street. The paved area is frequently used for exhibitions and displays. The memorial commemorates the people of Bolton lost during the First World War, and was unveiled on July 4th 1928 by the then Earl of Derby. Further inscriptions were added after the Second World War, and the bronze figures were added in 1933. These octagonal fountains were designed by Geoffrey H. Brooks and built between 1964 to 1965. This statue is on your right erected in 1873 by public subscription. Dr and Mrs Samuel Taylor Chadwick as a New Years gift placed £17,000 with trustees for the building of an orphanage on January 2nd 1868. This was just one of the many charitable things he did for the people of Bolton. He also paid £5,000 for the Chadwick Museum of natural history in Queens Park (now demolished) which opened in 1884. His surgery in which he practiced was close to this spot. His grave is in St. Peter's church yard. This statue is on your left. Put here in 1900 in memory of this textile machinery engineer. Lieut. Col. Benjamin A. Dobson was Mayor of Bolton 1895 to 1898 and was knighted. 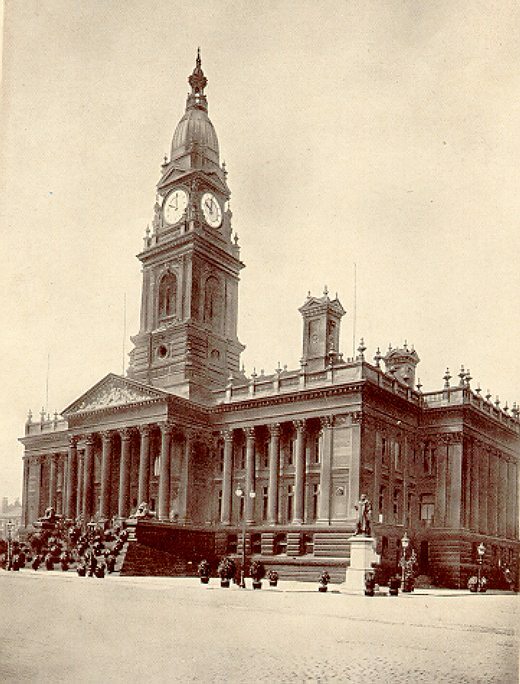 The town hall itself, opened on June 5th, 1873 by Prince Edward (Prince of Wales, later King Edward VII) and Princess Alexandra. The silver key used is kept in the museum. Built from stone quarried locally and from Yorkshire, the site was acquired in 1865, and the foundation stone was laid in 1867, but without any ceremony due to the difference of opinion of exactly who should lay the stone. You can enter the town hall which will also give some details on forthcoming events. 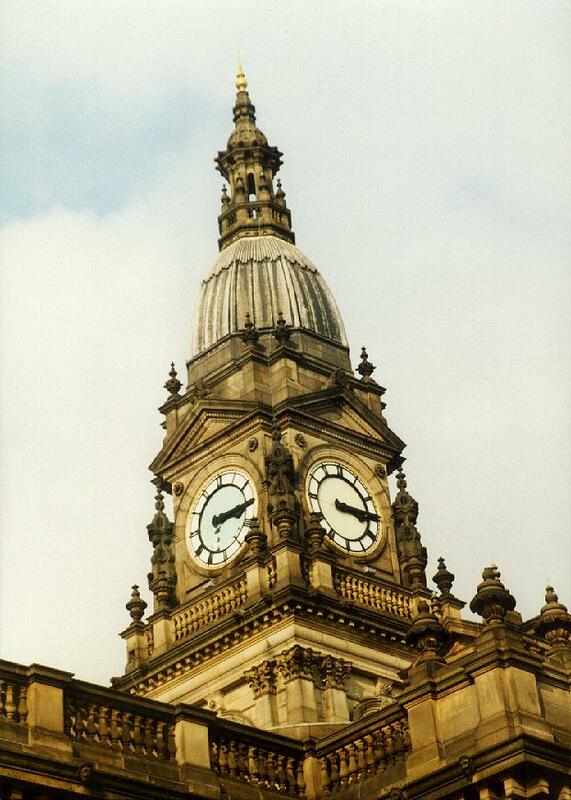 The top of the clock tower is 61 m (200 feet) high. The original old Albert hall, inside the town hall, suffered a major fire on November 14th, 1981 where the Albert hall was destroyed. This was rebuilt into the new Albert Hall and the Festival Hall which are used for various events, you can reach the booking office from Le Mans Crescent, which also houses the town's Tourist Information centre. 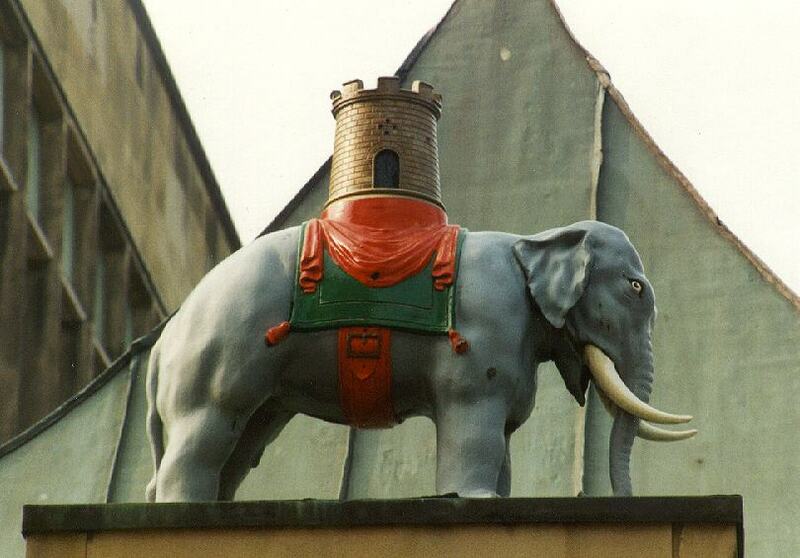 The elephants used to grace the gateposts of the old Bolton Bleachworks. Made from cast iron, they were placed on the gates by the owner of the bleachworks, Thomas Ridgeway Bridson (1795 - 1863). They stood proud for 127 years until the demolition of the works in 1977. The owners William Kay (Bolton) donated them to Bolton in 1978. There is more details of Bolton's elephants here. This is the canopy used by various charities, here it's seen with goods displayed on the left. Outside border and petal details - Blue pearls granite recycled from the old fountains. 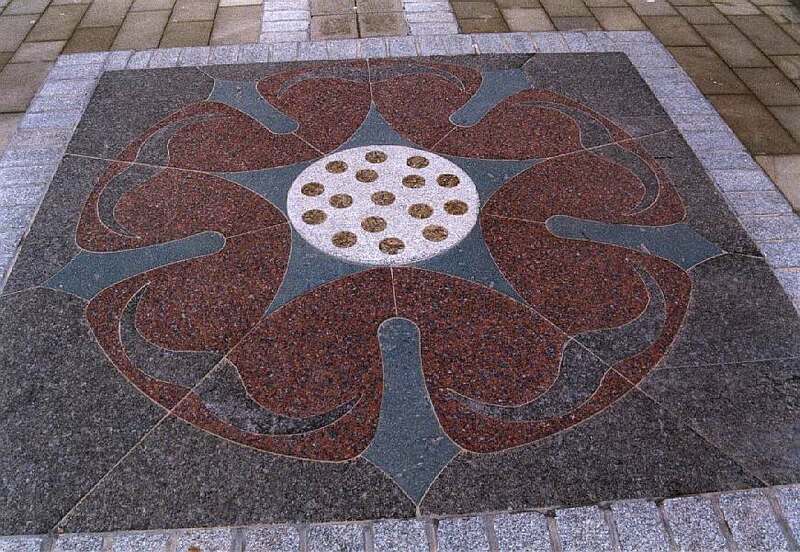 The memory of the old fountains live on in this design, as does a remembrance of the cotton trade with links to Africa.